If this is your first visit, be sure to check out the FAQ by clicking the FAQ link. You have to Register & Subscribe before you can post, except in the Visitors Section, click the Register link to proceed. To start viewing posts, select the forum that you want to visit from the Forum tab above. Please visit the dedicated Visitors Section for full details of the forum and a video tour of the forum. The forum is now a paid members only trade forum and a paid for subscription must be taken out by all members. 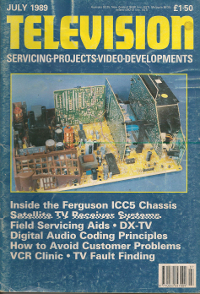 Old Television Magazine articles can be read by all visitors without the need to register! Subscriptions are from £30 to £80 per year. Newly registered members have 7 days to choose their subscription level. Please view the forum tour video and membership option information in the visitors section. Thanks for your interest in Television-Magazine-Forum. I look forward to seeing you on the forum soon. Television-Magazine-Forum supports all major internet browsers but we recommend Firefox for the best experience. Television-Magazine-Forum T-M-F (C) 2019. All Rights Reserved.